Together with Joshua Reynolds Thomas Gainsborough was one of the great 18th-century British portraitists. A certain rivalry existed between the two painters, which became more pronounced after Gainsborough moved to London in 1774. It would appear that he first trained in Suffolk then completed his studies in the capital with Hubert François Gravelot and Francis Hayman, establishing himself as a portrait painter in his native city of Sudbury in 1748. Despite this, Gainsborough’s true metier was landscape painting and his earliest known works are views that recall those of the Dutch 17th-century landscape painters, inspired by the works of Jacob van Ruisdael and Jan Wijnants. At this period he also painted small-format portraits in which the sitters are located in outdoor, rural settings in a natural, simple manner. In order to expand his clientele Gainsborough moved to Ipswich in 1752 and about 1759 settled in the elegant spa town of Bath where his portraits underwent a transformation. From that point on his sitters are depicted life-size and full-length in elegant poses, wearing fashionable dress and set against landscape backgrounds. In 1774 Gainsborough decided to move to London where he remained until his death in 1788. After his death Reynolds made him the subject of one of his “Discourses” in which he described with great clarity his rival’s most important qualities, considering him outstanding in the genre of landscape, which was hitherto considered of lesser merit. 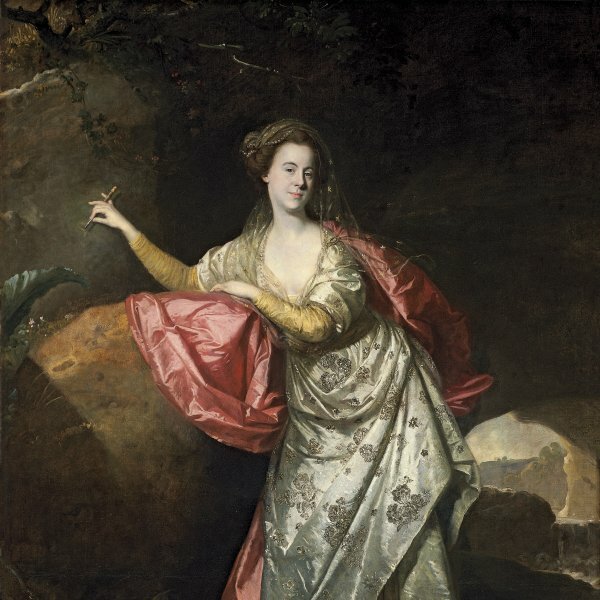 The present Portrait of Sarah Buxton entered the Thyssen-Bornemisza collection in 1983 and was displayed at Daylesford House, the UK home of Baron and Baroness Thyssen. Its provenance is known almost in its entirety since Gainsborough painted it in 1776–77 following his move to London. The canvas remained with the descendents of the Dumbleton family, Sarah Buxton’s married name, until 1918, when it was sold at auction. It was subsequently in private collections in the US and France and in the Kimbell Art Museum before it was acquired for the Collection from Newhouse Galleries, New York, in May 1983. Sarah Buxton was the daughter of Isaac and Sarah Buxton of Bellfield and the portrait was executed prior to her marriage to Charles Dumbleton in June 1777. The mother of four children, Sarah died on 5 December 1783. The canvas is a fragment of a larger composition that was cut up after it was damaged in a fire. 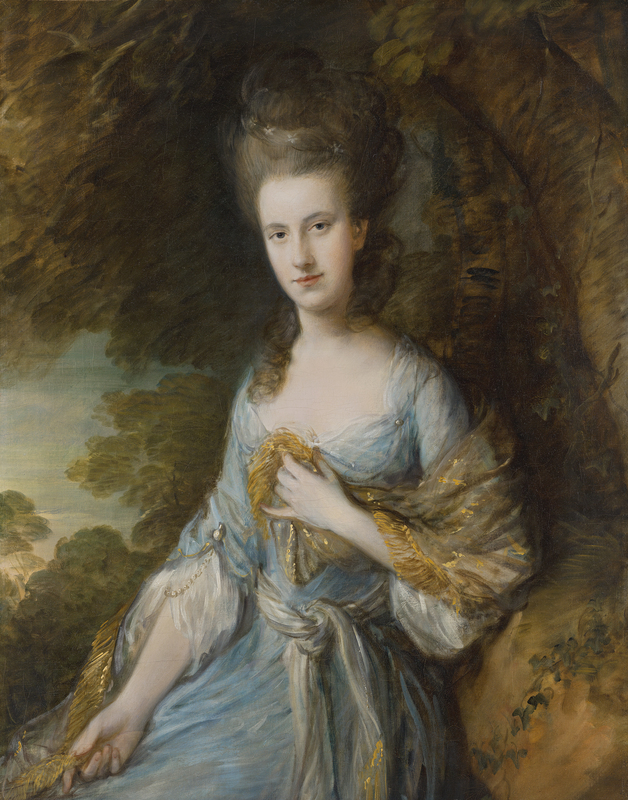 Gainsborough presents the young woman wearing an elegant pale blue gown, fashionably dressed and coiffured. She poses in a simple manner, peacefully seated in the corner of a garden with large trees behind her, against which her figure stands out, particularly the pale flesh tones. The canvas reveals Gainsborough’s distinctive technique in which the soft textures of the clothes are created through lengthy brushstrokes. The sitter’s long face is emphasised by the high and elaborate hairstyle and is painted with compact strokes and green nuances in the shadowing. Another fragment of this work depicts a dog at the sitter’s feet on the left, looking up at her.1 The background was undoubtedly a landscape of which only a small area is now visible.